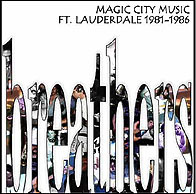 Straight from the introductory Paperback Byrdsian chimes of “Did You Think,” the kick-off and-then-some on their grand new MAGIC CITY MUSIC: FT. LAUDERDALE 1981-1986 ceedee, the one and only Breathers remind us just how that defiantly jangle-jingle territory they laid stake to twenty years ago sounds as fresh and entirely riveting today as it must’ve back in those dank, dark years before the words “power pop” became a subterranean household pigeonhole. And it’s truly been that way ever since the faithful day original NRBQ drummist Tom Staley hooked his lot up to that most hook-laden of Louisville strummers Rick Harper (he fresh from Kentucky fried gigs alongside no less than Jerry Reed and Billy Swan). Their mighty musical mission? To forge a four-to-the-bar alliance that just never would settle for anything less than sounds and styles conjured by the Holy Trinity of Sixties B-Bands -- as in Beatles, Beach Boys, and those above-referenced Byrds –- yet whilst boldly carving brave new paths towards what in retrospect can be identified as most presciently Pop-worthy in every solitary sense of the claim. Soon enough joined by Erich Overhultz’s keyboards and finally the late, very great guitarist Bob Zohn, Tom readily admits “we were a recording unit primarily, and it served as an outlet for our individual creations. But by far Rick was the most prolific songwriter, and he was the motivating factor in the band.” Indeed, even passing listens to “Got A Woman” (wherein Rockpile chance upon Augie Meyers in some Dade County back alley) and especially “Coffee Table” (have you EVER heard a more pointedly cinematic attention to detail, lyrically especially, within a mere two-minutes-fifty-six?!!) demonstrate the uncannily gentle genre-leaps a Harper composition can take …whilst somehow making it all seem and sound so utterly, hum-along-ably easy! Elsewhere along similarly vocal veins, how is it Dave and Ansell Collins can cross the Four Tops (“Won’t Somebody Tell Me”), John Lennon spreads “Mind Games” all over stray Harmonicats (“Don’t It Make You Feel”) and Tom’s ol’ Rhythm and Blues Quartet can take on the not-so young Rascals (“Doctor Doctor”) and in the process have this all –- and THEN some! – somehow sound so ridiculously, righteously …RIGHT? I mean, didn’t Man quit making such effortlessly wreckless records ‘way back within the latter reaches of the L. B. Johnson administration?!! But our heroes deftly cooked ‘n’ cranked it all up again throughout their just-too-brief Floridian reign beneath Reagan’s watch, presidentially still speaking that is. And NOW, just in our nick of times you bet, this fearless foursome return to the current digi-age with every single inch of their sly, sonic sheen intact and their Message of Melody as wickedly inspiring as ever. Honestly, they -- whoever “they” are -- just don’t, won’t, or more likely CAN’T construct two and a half minutes as wholly, poignantly perfect as, say, “Love Is Together” anyway anyhow anywhere any more. Really! In April of '81 I was playing bass and singing harmony with Tim Krekel's band out of Nashville. Tom called me. Said he had a sure thing. Country band in Lauderdale and the bassist was leaving. Would I play? The Urban Cowboy thing was still in full swing there. So I went down and ended up staying thirteen years. An almost unfinished ditty that came to me walking down Bardstwon Road in Louisville at 3am. Insomnia. Inspired by the model on the cover of an old Evergreen Review mag. Had nothing on but a bikini top. Very inspirational. Had a horrible sore throat recording this. The last verse was re-sung later and I can hear it. Written in '73 during a fruitful songwriting period. This, and the track of "Older Than Tomorrow" are probably my favorites on here. I've heard people compare it to Pink Floyd and f@#k them... I like the bass harp. This might be the most commercial of the B's records. Huh? This is an unfinished rough mix with my overdubs done in Finchville in '95. Bob died in '87 of non-drug related natural causes. He was 35. He was also the original rhythm guitarist with the Sacred Frowns before Charlie Carmon came down in '74. Tom put this on his I'VE ALWAYS KNOWN cd a couple years ago. Written partially in Austin, mostly in L'ville for a friend in NYC. Bill Lloyd was in Miami to sing at a friend’s wedding and I dragged him into Prisma Sound Studio for a very quick overdub. Which I doubled twice later, truth be told. One of the photos I took of him at that session was on the back cover of Bill’s FEELING THE ELEPHANT record. Still in high school when this one came to me. Did a demo of this in '72 with my band Dusty. On this version I sound exactly like a duck. An amazing amount of work went into the production of this. About five sessions in two different studios. For a two minute song. Always loved this song of Erich's. He should have sang it, but he was uncomfortable with it. The track is great, with three pianos, three basses, no guitars... I've always considered this unfinished as well, as it needed lush BBoys backing vocals. I wrote. Bob sang. Going for a “Double Barrel” sound on this, Bob being an expert and historian. One take. I love his "yeah, heartache" at the end... Erich hates the Farfisa dischord, but it was my idea and I take responsibility. This has a Linn drum track that was recorded at David Lindley's studio in L.A. after Bob had left the Blue Riddim band. Tom played on top of this -- in fact, we all did as a band at the same time, instead of doing it one guy at a time like many would do now. Arthur Gabe, the engineer, played the guitar solo. I had nothing to do with the mix. There is a better version of this same take with piano, but this is how Bob mixed it for our German SUNSHINE ROCKERS record. Recorded at Soundshine Studio in Ft. Lauderdale on an unaligned 8-track. I remember being furious at the engineer. That's why I would never record my own songs there. Nice room, though. I gave up on it but Tom wanted to finish it. Many sessions. We were going for an Association-type vocal that would have a spiritual message without regard to belief, and a White Album backing track. I remember I was asked to do my best McCartney on this, so I dragged out the Rickenbacker 4001 instead of the Music Man bass I had been using and did it. I love Erich's piano intro. My most vivid recollection of these sessions is my girlfriend threatening to leave me as I tuned the sitar. She didn't. Steve Ferguson put a lot of input into this track. Tom issued this on I’VE ALWAYS KNOWN. Also a Soundshine recording. I was there just once for the bass overdub. Love Stuart Light's pedal steel on this. I believe this is about spending several hours in a sensory deprivation tank. This was also on I’VE ALWAYS KNOWN. Written probably the same day as “Don't It Make..." This is kind of the dregs, really. Not really much to say. I think Tom likes it. Bob singing. Recorded at Prisma with overdubs in Miami at Sync Studio. Can't remember how we learned of the place. They had the first digital converter machines I'd ever seen... in '84! This is one of many different mixes. Steve sang and played all the guitars and backing vocals. Stuart Light did a great job with saxes - bounced down to one track! I mixed this and am responsible for the bass and overplayed cabasa. I am on this rough mix of the backing track. Sounds like toluene-influenced Sun Ra!